Knee arthritis can be very painful for anyone who is suffering from it. At Orthopaedic Specialists, Dr. Stacie Grossfeld offers knee arthritis injections which are a popular form of pain relief. However, in order to know how to treat arthritis, it is important to know what arthritis is, what causes it, and all treatment options available. Arthritis is not a single disease. In fact, there are over 100 different arthritic conditions that human beings are susceptible to and even more related conditions. Arthritis is often thought of as a disease that only affects the elderly; however, people of all ages can have, and do have, arthritis. Arthritis is an inflammation in the joints that causes severe pain and stiffness. The disease often affects range of motion and can be debilitating if not treated. Thankfully, there are a wide variety of treatment options for arthritis and Orthopaedic Specialists offers several knee arthritis injections for pain management. In the video above, Dr. Grossfeld explains the different versions of knee arthritis injections available at Orthopaedic Specialists and the benefits of each. Those benefits are also detailed below. Cortisone is a steroid that can be described as a “liquid ibuprofen”. At Orthopaedic Specialists, Dr. Stacie Grossfeld uses a thin needle to inject cortisone directly into the knee area. Cortisone blocks inflammation from increasing in turn relieving pain caused by knee arthritis. Cortisone shots relieve pain for around 3-4 months before the cortisone wears off and inflammation returns. Most insurance companies in the Louisville, Kentucky area will cover cortisone shots as a pain treatment option. This treatment option is considered the most conventional and least expensive in the realm of knee arthritis injections. Hyaluronic acid injections are interesting. Unlike cortisone which is a steroid, hyaluronic acid is naturally produced by the body. Hyaluronic acid is highly concentrated in the eyes and the joints; however, hyaluronic acid injections are often sourced from rooster combs and made synthetically. This gives hyaluronic acid injections their highly known nickname: “chicken fat shots”. Don’t worry though! Hyaluronic acid shots do not contain any fat, just natural substances that help relieve joint pain. Hyaluronic acid injections are beneficial knee arthritis injections that last around 5-6 months. When a joint is healthy, the synovial site around that joint produces thick and healthy hyaluronic acid. As arthritis sets in, this acid becomes thinner and thinner until it is an almost watery substance that does not benefit the joint. This is where hyaluronic acid injections help. They trick the joints, and the synovial site, into thinking that it is healthy. This then prompts the joint to produce thicker, healthier acid itself. However, the body is a smart organism. Once it realizes that the joint does, in fact, have arthritis then it thins the acid down again. Hyaluronic acid shots help the body, as previously stated, for about 5-6 months then more knee arthritis injections must be administered. Fortunately, most insurance companies in the Louisville, KY area cover hyaluronic acid shots. Humana does not, but Dr. Grossfeld isn’t aware of any other insurance companies that don’t cover this form of knee arthritis injections as a treatment for knee arthritis. PRP injections are a form of treatment for knee arthritis that is growing in popularity among orthopedic surgeons and patients alike. 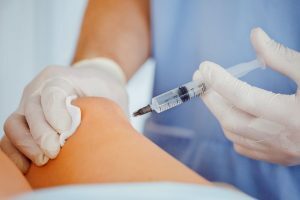 This form of knee arthritis injections are somewhat similar to hyaluronic injections in that they are both produced by the human body. However, hyaluronic injections are synthetically derived whereas PRP injections truly come straight out of the patient’s body and then back in as a treatment option. PRP stands for Platelet Rich Plasma which is found in blood. Platelet Rich Plasma helps the body heal itself and features growth factors in the platelets. These growth factors help to reduce inflammation around the joint. They also help to strengthen the cartilage and make it healthier. PRP injections last slightly longer than hyaluronic injections do and can be administered every 6 months to manage pain. 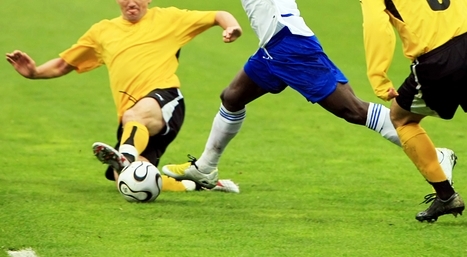 There aren’t many insurance companies in the Louisville, KY area that cover PRP injections. Dr. Grossfeld does offer the most affordable PRP injections in the city. At Orthopaedic Specialists, one round of PRP injections is $380 and can be taken care of in 20 minutes. Stem Cell Improvement Therapy is the “new frontier” and “Mercedes Benz” of knee arthritis injections, as Dr. Grossfeld says. This form of pain management therapy uses amniotic stem cells that are taken from the amniotic fluid of healthy Cesarean sections. Once the stem cells are removed from the amniotic fluid then they are screened and cleansed in an FDA-approved laboratory before being frozen. The frozen stem cells are then shipped to Orthopaedic Specialists when they are needed then are thawed and injected into the arthritic knee. Stem Cell Improvement Therapy is similar to PRP injections in that the fluid is coming from the human body. However, PRP injections are drawn from the person in pain. Certain factors such as the age, health, and wellness of the patient will affect the effectiveness of the PRP injections. Stem Cell Improvement Therapy, on the other hand, uses stem cells from brand new amniotic fluid that is at its optimal health. Stem Cell Improvement Therapy injections are available at Orthopaedic Specialists and administered by Dr. Stacie Grossfeld. Some insurance companies do cover this form of knee arthritis injections as a pain treatment, so speak to your insurance provider if interested. These shots are around $1,600 per injection session and greatly improve pain in arthritis knees and other joints. It is important to know that these stem cells are not taken from newborn babies. They are taken from the amniotic fluid which surrounds a fetus in-utero and is discarded after birth. This treatment option is using a newfound form of medical technology that would otherwise be thrown away. As stated earlier, arthritis is a serious disease that affects people of all walks of life. Joint inflammation cannot be healed, but it can be reduced and pain can be managed through different treatments. If you are suffering from joint pain in your knees, knee arthritis injections like the four mentioned above will help ease your pain. If you would like to learn more information on the different forms of knee arthritis injections offered at Orthopaedic Specialists, or other treatment options for arthritis in general, contact Dr. Grossfeld today. If you are suffering from joint pain due to inflammation, arthritis, or an injury — contact Dr. Stacie Grossfeld today by calling 502-212-2663. Dr. Stacie Grossfeld is an orthopedic surgeon in Louisville, KY who is double board-certified in orthopedics and sports medicine. She has over 20 years of experience in orthopedics and is always looking for new treatment methods to bring to her clientele. Orthopaedic Specialists has two convenient locations in Louisville, KY and is currently accepting new patients.